Please note: names are not printed on the passes when you place your order. Passes have blank signature spaces for the pass holder(s) to sign, making it convenient to give as a gift. THIS PASS IS NOT THE LIFETIME SENIOR PASS (FOR AGES 62 AND UP). To purchase the senior pass, please click here. The America the Beautiful National Parks Pass is your ticket to recreation sites across the country. Headed for fun and adventure in America's parks and forests? Save time and money by getting your America the Beautiful National Parks Pass and help protect these national treasures for generations to come. 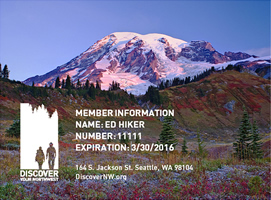 Buy your pass and discover America's best idea by visiting your public lands! The America the Beautiful: National Parks and Federal Recreational Lands Annual Pass (Interagency Annual Pass) is honored nationwide at National Park Service, Forest Service, US Fish and Wildlife Service, Bureau of Land Management, and Bureau of Reclamation recreation sites charging day-use or entrance fees. Valid for 12 months from the month of purchase. Expires the last day of the month punched. Includes two signature lines and any two individuals may sign the pass. Both are considered pass holders. Admits pass holder and any accompanying passengers in a private non-commercial vehicle at per vehicle fee sites. At per person fee sites, admits pass holder and up to three (3) persons age 16 and older. Children 15 and younger are admitted free of charge. Photo identification may be required to verify ownership. Physical pass must be present at time of use. Confirmation email(s) or receipt(s) are not acceptable for entry. To plan your trip and determine if this pass is the right one for you, please contact the offices of the federal recreation sites where you plan to visit. The Annual Pass offered on this website is just one of several Pass options available. If you are a U.S. citizen or permanent resident age 62 or older, or receive disability benefits, you may be eligible for the Senior or Access Pass. If you have questions, contact your local Federal recreation site, or visit your local Federal recreation site&apos;s web page for more information.